For decades, China was viewed by U.S. strategists as a struggling communist nation with a massive population that really did not represent any kind of strategic threat to the United States at all. But that has now dramatically changed. Thanks to trade agreements that are extremely favorable to China, the “Great Dragon” has risen and has become a formidable economic machine. Already accounting for a fifth of humanity, this new economic muscle has also allowed Beijing to dramatically reform and upgrade the Chinese military. Now China is without a doubt a world superpower and it stands poised to be a major player on the world stage during the last days. So just how powerful of an economic force is China now? Well, in 2010 China is expected to replace Japan as the world’s second-largest economy. Not only that, but China has overtaken Germany and is now the biggest exporter in the entire world. China sells more stuff to other countries than anyone else in the world. That fact alone is enough to make China an economic superpower. Citizens of the U.S. like to think of themselves as the greatest economic superpower, but the reality is that the average American is drowning in debt. In fact, the average American piled up even more debt this past Christmas season buying cheap plastic stuff made in China to exchange with family members around the ole Christmas tree. The truth is that U.S. wealth is flowing into China at a staggering rate, and nobody seems to want to do a thing about it. And thanks to ridiculously one-sided trade agreements, that arrangement is likely to continue for the foreseeable future. But China’s growing economic power is only one side of the equation. It is China’s emerging military strength that has U.S. military strategists starting to sit up and take notice. Very quietly, China has been engaged in one of the greatest military buildups of modern times. On Wednesday, Wallace Gregson, the Assistant Defense Secretary for Asian and Pacific security affairs, made the following statement regarding China in testimony before the House Armed Services Committee…. 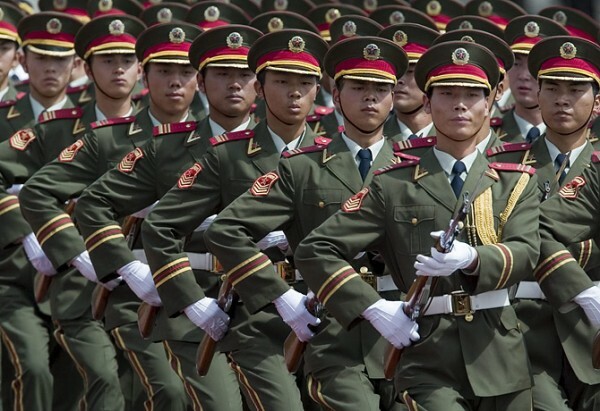 The truth is that China has always had one of the world’s largest militaries. The PLA maintains a force of over two million men, and it is complemented by the world’s third largest air force and the world’s largest small ship navy. But now China has enough wealth to develop and purchase cutting edge military technology. The reality is that China is quickly becoming a very serious strategic threat to the United States. For example, China has just successfully tested a new technology designed to shoot down incoming missiles in mid-air. In addition, China is also pursuing technology that could home in on and destroy satellites in orbit. Nobody was concerned about China developing these types of capabilities a couple decades ago. But now armed with billions of dollars from the West, China is rapidly gaining ground on the U.S. military. China is rapidly expanding and modernizing their conventional forces as well. China is planning a massive investment in helicopter production with a goal of increasing its helicopter fleet tenfold by the end of the year. There are also rumors that China is planning to build several aircraft carriers, although Beijing is denying those rumors at this point. There are also reports that the Chinese military is considering setting up military bases and possibly deploying forces in the Middle East over the next decade as a means of protecting its access to strategic materials. You see, China is heavily invested in the Middle East – particularly in Iran. In fact, China is Iran’s main customer for oil. China has plans to invest approximately 43 billion dollars in Iran’s oil industry, and it has expressed serious concerns about a potential attack on Iran by the United States and/or Israel. And that right there might end up being the key which brings the United States into conflict with China. The Chinese are not going to sit idly by and watch the United States and/or Israel decimate Iran and cut off one of their key sources of oil. The growing Chinese economy desperately needs oil to keep on churning. A reliable supply of oil is of the utmost strategic importance to the Chinese government. If the United States and/or Israel goes to war with Iran it would likely infuriate China. In fact, there are many who believe that it is only a matter of time until the United States and China go to war. Let us hope that day does not come any time soon, but the reality is that China has become a world superpower and it is going to be a major player in the last days. Anyone in the U.S. government who does not take China seriously from now on is making a huge mistake. The Dragon has risen and it is not going away. I always believed that China will one of the Kings of the East of Rev 16:12.